These aren’t bred for looks. The wrappers are uniform in color, but some are lumpy and most are veiny. The start is unassuming but nice — an earthy core and a distinct peanut note on the finish. It is medium bodied, though it becomes rich with the addition of powdery cocoa flavors after an inch. It is slightly dry on the palate, so keep a beverage handy. If this description sounds familiar, it should. 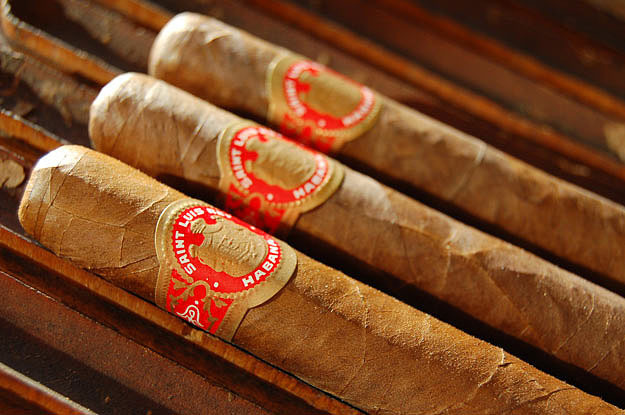 The first third of the Serie A tastes remarkably like a few smokes that my fellow Pepin Garcia fans will know well — the DPG Series JJ and the Habana Leon. The construction is only average. The draw is slightly firm, I had a few minor runners, and the burn required touchups. Nothing I couldn’t live with, but this hardly smokes itself. It’s on the second half that the benefits of age become apparent. When I first sampled these close to a year ago, they were reasonably strong, earthy and nutty from start to finish. Fine, but one-dimensional. Today, the strength is dialed down a notch, while the complexity has improved. The third quarter of this stick is particularly impressive. The base flavor is now a balanced mix of trademark Habano earth, cocoa, coffee with cream, and nuts. Occasional meaty notes add interest. The early dryness has mostly disappeared. It finishes largely as it started — more earth and nuts — but predictably stronger and richer. In all, this is an excellent stick with obvious aging potential. CONCLUSION: The Saint Luis Rey Serie A is a good smoke when fresh. It’s a very, very good one after a year. Odds are I’ll be touting its greatness a year or two from today. Its flavors haven’t yet achieved the seamless complexity of greats like the Bolivar RC or RASS, but the Serie A has the goods. Spotty construction will always be a limiting factor, but otherwise consider a cab of these ($300-$350) to be a can’t miss investment. Hm, this is a cigar that I was looking forward to reviewing as it has received amazing ratings in my local cigar magazine (L’amateur de cigare). Coming soon! Looking forward to seeing what you think of it, Denis. Can you get them with a little age on them already? Not that they aren’t good when young, but they change appreciably with a year + on them. I will try - they became hard to find in town since these praises have been published! Just found a batch of SLRSA without a box code (so, before 2000) in La Casa del Habano in Dubai. They don’t smell at all.. hope they are nice. we smoked a cigar at the same time and sent each other a Pic. of a new prez in the USA, NO MATTER WHO WON.and to take a pic. with the cigar and send it off to us . The text is in english and others. Come and join us for the biggest smoke in the world , just for the fun. Thanks for sharing that, Guy. Denis, nice score! Dying to hear how those pan out for you. As I recall, the ones that rated 93 or so in CA were from 2000, so I’d think you’ll be in good shape with some from around that era. I have to say I haven’t been too impressed with the 06s… so far. Nice smokes, but not worth the trouble or expense: your “one dimensional” sums it up for me. But that 3-5 year window is about to open up, and I am ready to throw the sash, lighter in hand. I’d have thought these to be right up your alley. If you ever decide to give up on them, PM me and we’ll swing a trade! I think I’ll try another one out soon and see if there has been any progress — stay tuned. You are right though — the body and strength are just about where I like them. I just haven’t been impressed with the flavor… nothing Pepinesque as far as I can tell. Is there anything ironic about complaining that a Cuban doesn’t live up to a Pepin?